This post contains affiliate links. This means that if you decide to click through and make a purchase, I might receive a small commission that goes back into developing more free recipes for you, here on the blog. Thank you for your support. So. Here's something new. Artichoke hearts with garlic and chives. I made this one afternoon, when I discovered a can of artichoke hearts in the back of the cupboard after my husband announced he was going to light the barbecue. Yep, I thought. They'd go very nicely, indeed. But they needed flavour. Out came garlic, extra virgin olive oil and chives. This little side dish is cheap and really easy to put together. It's quick, too - it could be on the table in less than a minute, if you find your can of artichoke hearts quick enough. It goes well with all grilled meats but especially chicken, tuna and lamb. 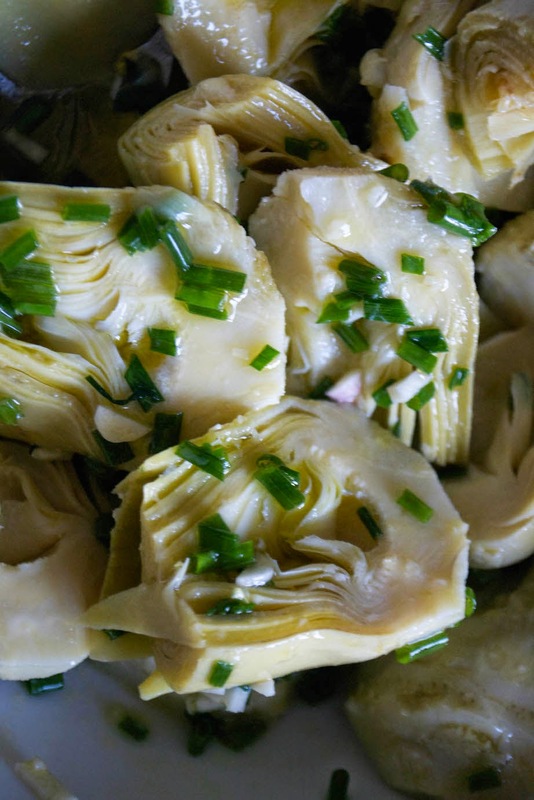 The soft, tender artichoke hearts need the punch of raw garlic and then oniony chives. The olive oil drizzled over at the end gives a silky richness and sweetness. I hope you like it. Combine the drained artichoke hearts, the chopped garlic, chives and olive oil into a bowl and stir well. Serve cold, alongside grilled and roasted meats and fish.